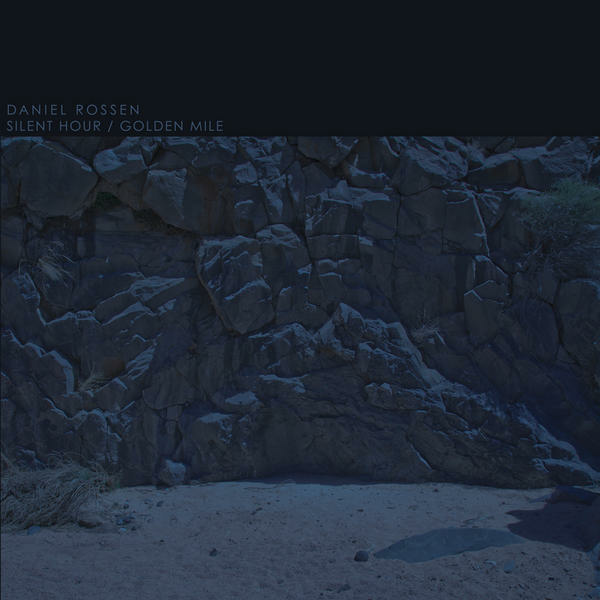 daniel rosson // silent hour / golden mile — common reactor // music. With a new Grizzly Bear album coming out this year, the first since their 2009 magnum opus Veckatimest, multi-instrumentalist Daniel Rossen has taken the opportunity to release this brief five track solo EP in the interim. Silent Hour / Golden Mile is built around bright twangy guitars and a deep sense of melancholy, layered with rich instrumental interludes that while never a million miles away from his Grizzly Bear output, showcase Rossen’s knack for a canny melody. Thematically, it’s a dark offering with a sense of isolation and weariness running through these five tracks, but there are so many flashes of inspired musical phrases that they betray the often-times desolate lyrics. Opener “Up On High” attempts to draw emotion from the unemotional, with Rossen singing “In this big empty room/ finally feel free/ to sing for me” as the bass and drum rolls sporadically tumble in tandem over lush string harmonies. The song has an airy, loose feel aptly fitting this sense of emptiness and withdrawal – “push me off to sea/ swim for me”, while the bright acoustic underpins it all. Exile-era Stones are invoked in the instantly familiar “Silent Song”, its Lennon-esque “Exile on the Hill” vocals embellished by a lovely echoing Keef-style lead guitar phrase that will tease some air guitar from your fingers. Weary, snarling lyrics of unattainable redemption bubble underneath the folksy acoustic guitar while the vocal harmonies hit the high notes. The downbeat descending bass patterns of the chorus are banished by that beautiful guitar melody each time. Maybe there is redemption here after all. Rossen’s distinctive picked guitar style is layered on for “Return To Form”, becoming more rhythmic as the song progresses. After a nice mid-tempo build up, there is a sublime moment late into the song as Rossen sings “light up your fire again/ and throw him on”; the drums kick in majestically and it’s Bowie and The Beatles revived while dramatic strings vie for attention amidst the retro revivalism. “Saint Nothing” almost buckles under the weight of its own gravitas, a rejection of spiritual understanding that is ultimately “an empty phrase / a hollow sound”. There is a lingering sense though that this track comes across like an unfinished demo waiting to be handed over for adornment. This can be the tricky part for the listener of this EP – viewed in the shadow of the Grizzly Bear output it can at times seem sparse, like sketched outlines waiting to be colored in, almost as if these tracks were intended for release by the band at some point. Rossen’s jangling guitar again underpins “Golden Mile”, given a hardened edge by the drums, bass and guitar that barge in while monastic chanting resonates in the background, with the singer finding a skewed peace amidst the “madness all around”. Silent Hour / Golden Mile is a sometimes flawed, brief yet worthwhile experience. There is, admittedly, an element of samey-ness, but on the EP’s high points, “Silent Song” and “Return To Form”, the results are impressive, if somewhat retrograde. The question stands though if this is a pre-cursor to more-of-the-same solo releases, or merely a stop-gap to fill time between the duties of the day job. In any event, this should whet the appetite for the forthcoming Grizzly Bear album while providing a brief snippet of what the solo Rossen is capable of. favorite tracks // "golden mile," "silent song," "saint nothing"